Created on a rainy Sunday. I just couldn't resist the parachute background for this get well card. 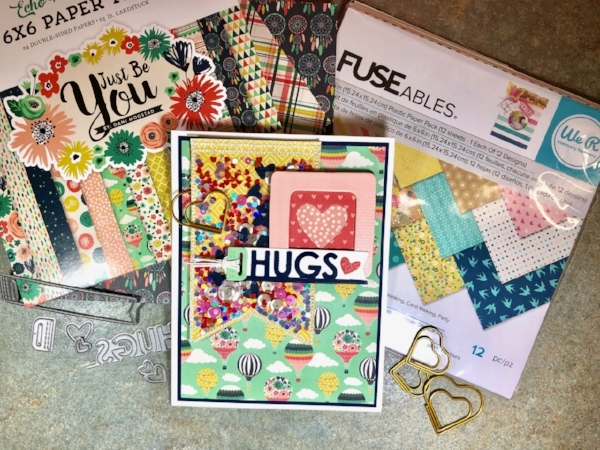 I purchased this FUSEables Plastic Paper Pack by We R Memory Keepers from Hobby Lobby on clearance months ago. I wasn't quite sure what I was going to use it for but when I saw the sketch by MFT, I immediately thought to create a shaker iwth this paper. I created the pocket with my Fuse Tool. The plastic paper bonded easily with clear plastic from a Paper Studios pocket page. 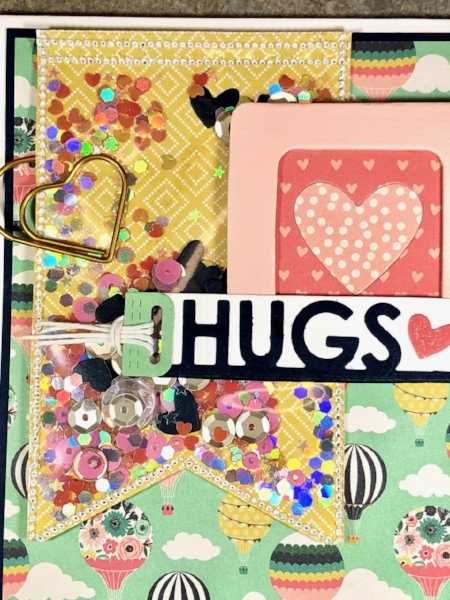 I filled the banner shape with a variety of sequins and die cut navy hearts from the hearts in the My Favorite Things Tag Builder Blueprint 5. I added a gold heart clip from Paper Studios for interest. I die cut the Hugs from the Technique Tuesday Hugs Die and placed it on a banner cut with the My Favorite Things Tag Builder Blueprint 5 set. I've had the pink frame forever, not sure the brand, and inlaid a heart using the same Echo Park paper pad. This card uses the same sketch layout with the same Echo Park paper pad. I plan to keep this card on hand to give to someone with a fun selfie in the wood veneer polaroid frame. I'm not entirely sure what brand the Smile die cut is, I know I purchased it at Hobby Lobby so I think it is Sizzix. I printed the #saycheese on cardstock and cut it into a banner shape, I thought the Smile needed a little something extra. The polaroid woodcut and camera washi tape is from Paper Studio and the flower is something I had in my stash.